Did you know that calcium represents up to 2% of your body weight? Or that magnesium is involved in over 300 enzymatic reactions in the body? We know minerals are important, but we often don’t consider exactly how much they do, or what can happen when we don’t get enough. Our water can provide us with up to 20% of our daily minerals*, and while people need differing levels of vitamins and minerals in their diet, many people fail to get adequate amounts from food alone**, leaving them deficient. It becomes extra complicated for individuals with dietary constraints that mean they cannot eat the foods that provide a lot of the minerals our bodies need. RO Filter membranes remove extremely small particles from water that they purify. remove extremely small particles from water that they purify. During the process of Reverse Osmosis, or RO for short, larger particles (like viruses and other impurities) are filtered out from the water, leaving pure water molecules to pass through your faucet. While there are many benefits to this process, the filter is so efficient that it also removes beneficial minerals like calcium, potassium, and magnesium. This can lead to two main problems. The first is the obvious demineralization of the water. While it has been hotly debated, the World Health Organization has completed two studies that indicate drinking demineralised water can compromise your health. Although the minerals in water are not a substitution for the minerals we should be getting from our diet (and shouldn’t be treated that way! ), they can be an important supplement. Removing these minerals can also leave the water tasteless. Many of us are used to the taste of minerals in our water, and therefore can find this bland taste unappealing. Demineralised water will quickly become your least favourite kind. The second main problem is that removing the minerals from the water leads to high acidity levels. Our bodies are made up of mostly water, and our blood should be slightly alkaline. Demineralised water can be one of the causes of acidosis, which is thought to be an underlying cause to degenerative diseases. All liquids have a measure of acidity, determined by the pH scale. The scale is from 0-14. Anything under seven is acidic, like your morning orange juice or coffee. Seven is considered neutral, and anything above seven is alkaline. Our bodies do their best work when they are in a slightly alkaline state. Demineralised water is often at a 7.0 pH level or lower, which means it is not doing our body any favours. Water does not contain minerals when it falls from the sky, the minerals come from contact with the ground. This is why the concentration can vary so much from geographic region to geographic region. However, it is clear that minerals were intended to be in our drinking water, as they are naturally occurring and are essential to our health. While certain foods can provide some of what we need, mineral-rich drinking water fills the gap between what we can consume from food and the daily recommended levels. A deficiency can be dangerous. For example, in North America, a lack of magnesium has been associated with cardiovascular disease and type two Diabetes. We have established that we need calcium, magnesium, and other minerals to help us survive, yet we’ve also stated that the reverse osmosis process strips the water of its minerals. So how do we reconcile the two? At Mineral Pro, we are aware of the need for minerals to be in your water and have developed a proprietary “mineralization cartridge” that adds back these essential minerals after the initial filtration stages. How does it work? 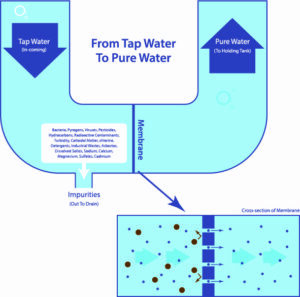 The tap water comes through your water supply pipe and flows through the sediment filter, followed by the carbon filter, and then through the RO Membrane, a semi-permeable membrane that has billions of tiny holes that water molecules can pass through. This is where the initial concentration of minerals is filtered out, along with the impurities, as they are too large to go any further. The molecules that are left behind are flushed out to the drain and the pure water carries on to the holding tank. 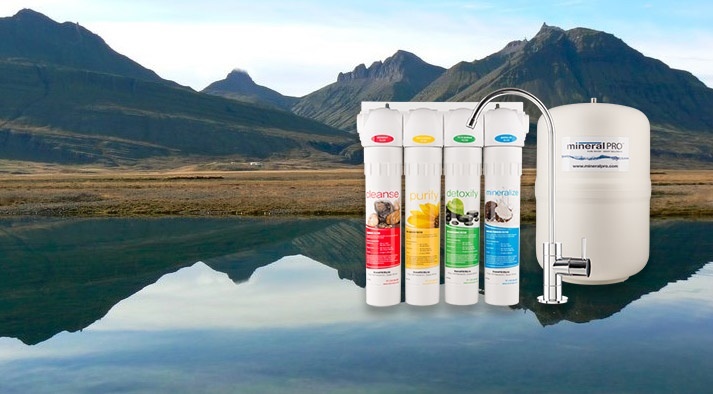 The mineralization cartridge sits between the holding tank and the faucet and consists of the naturally occurring minerals that were previously stripped from the water, ensuring the water is perfect the very moment it comes out of your tap. 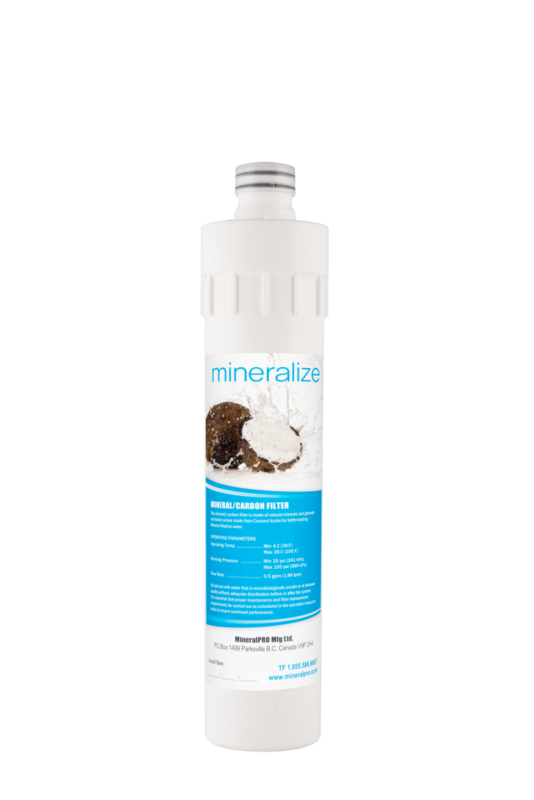 This mineralization filter is paired with a Natural Coconut Carbon Filter which adds a crisp lightness to your water and puts a final polish on the water, ensuring it tastes great. You shouldn’t be relying on your water to give you all the minerals you need, but you shouldn’t be stripping your water of minerals either. Allowing minerals like calcium, magnesium, and potassium to re-enter your purified water improves its taste and can have the added benefit of also improving your health. At MineralPRO it is important to us to provide a quality filtration system that you can use for years. You deserve quality filtered water that is good for your body and we look forward to giving that to you each and every time you turn on your tap! So if you are looking for safe drinking water with the right balance of minerals, take a look at Mineral Pro or give us a call at 1-250-586-6667.